For years, our customers have asked what types of chemicals should be used to clean and disinfect their bidet seats. 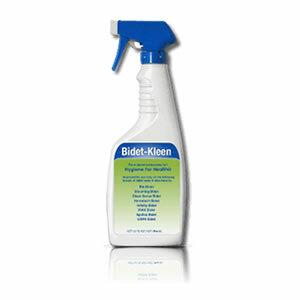 In response, we are now pleased to offer our exclusive bidet cleaner, Bidet-Kleen is a ready-to-use broad spectrum disinfectant sterilant, containing a “one-step” detergent-disinfectant, bactericide, tuberculocide, fungicide, Vircucide, and deodorizer. Bidet-Kleen comes in a handy 32-oz. spray-bottle. Complete product information may be obtained by contacting us. Please note that this product is not returnable.